It somehow simultaneously feels like the New 52 was both an eternity ago and yesterday. What an odd shitshow of an idea that was, and I say that as a person who has, comics-wise, preferred DC to Marvel for most of the 2000’s. To this day, I still have no idea what the New 52 even was; what from Post-Crisis continuity still “happened”? What was erased? It was this weird reset that actually just made everything even more convoluted, and I could never get my head wrapped all the way around it. 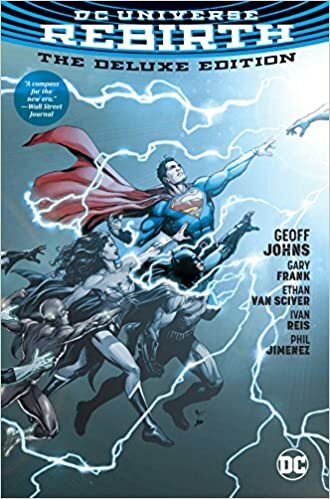 Not everything about it was bad; there were books that basically just kept going or, at least, didn’t focus on the new continuity of it all, and that was what I stuck to when I didn’t want to be reminded that I had no idea what was going on with the Trinity characters or what the hell DC did to Superboy or that Wally West was not around. Still, ultimately the best thing the New 52 ever did was end. Writer and Artist: Geoff Johns, Gary Frank, Ethan Van Sciver, Ivan Reis, and Phil Jimenez. Antagonists: No one; this is more of an establishing story than anything else. Rebirth is an extended one-issue story that ultimately starts the tearing down of the New 52, and it does it through two extremely important methods. The first of which, and the major focus of the story, is the return of Wally West. Rebirth is ultimately Wally’s tale, as he regains consciousness in the Speed Force and fights to return home. With the new continuity and the adjusted timeline, Wally no longer has a lightning rod he can focus upon to which to return. He finds Linda Park and materializes before her, but she rejects him in her confusion and fear, and he is absorbed back into the Speed Force. Wally tries a few other contacts in hopes of at least warning everyone of what he has discovered, but neither Johnny Thunder nor Batman are able to recall Wally back into the physical dimension any more than Linda. Feeling himself discorporate into the Force, Wally makes one final push to visit his uncle and mentor, Barry Allen, and leave him a warning. As West is being pulled away, though, it’s finally Barry who remembers him and, in doing so, acts as Wally’s lightning rod, enabling him to return. Wally West is back! The second huge occurrence of note in Rebirth is the allusion to Watchmen being a part of the DC Universe. There are callback artistic designs and even word-for-word quotes from Watchmen reinterpreted here, and it culminates with Batman finding The Comedian’s iconic smiley button lodged in the wall of the Batcave. The epilogue features the disembodied voice of Dr. Manhattan reminding Ozymandias that nothing ever ends. This feels like a huge 30-years-later cash grab because DC knows Watchmen remains one of the industry’s high-water marks and the idea that they could blend its reality with that of Superman and Batman would blow fans’ minds. As of this writing, I believe DC has continued dropping the occasional hints about this, but has not full-on paid it off yet, and I’m sure the story will be… big? I mean, it almost has to be one of the most prominent events in comics history when it’s completed. I will wait until we see what DC has been planning before passing judgment, but I’m at least wary. I suppose the premise is that Dr. Manhattan is the being more powerful than Darkseid that Wally has found out about. He obviously would have the power to eradicate DC’s continuity, and the big question is obviously… why? How long after Watchmen does this event take place? Has Manhattan lost touch with what humanity he had left? Will it all end with Superman punching him really hard? I mean, probably; it IS a DC book. Talking Point: So with Rebirth being the beginning of the end of the widely-panned New 52 experiment… where did you stand on it? It absolutely had its supporters in the world; were you one of them? What did you like or hate about the New 52 universe in DC? Do you think it was a success or a failure? It’s hard to grade this because Rebirth is more of a bridge between continuities than a fully-formed storyline. It’s important for what it is, but it is fairly innocuous in a bubble. I’m extremely overjoyed that Wally West returned, but also quite annoyed that DC is shoehorning in The Watchmen into their own universe. Call it a 5/10 and split the difference? Yep!